Las Vegas South Premium Outlets® offers more than 145 outlet stores including Michael Kors, Coach, Movado, Armani Exchange, Polo Ralph Lauren, and many more. We are a wonderful climate controlled indoor mall with additional shopping choices outside in our promenade. Las Vegas South Premium Outlets®serves the nearby communities of Henderson, and the greater Las Vegas area. Conveniently located 2.5 miles south of the Strip with easy access from the I-15 and the I-215. Also while visiting, we have even more choices in stores in our sister mall, The Forum Shops® which is located in Caesars Palace on the Strip. We also have Las Vegas North Premium Outlets® located just north of the Strip. Get the latest sales, offers and coupons from our outlet stores! 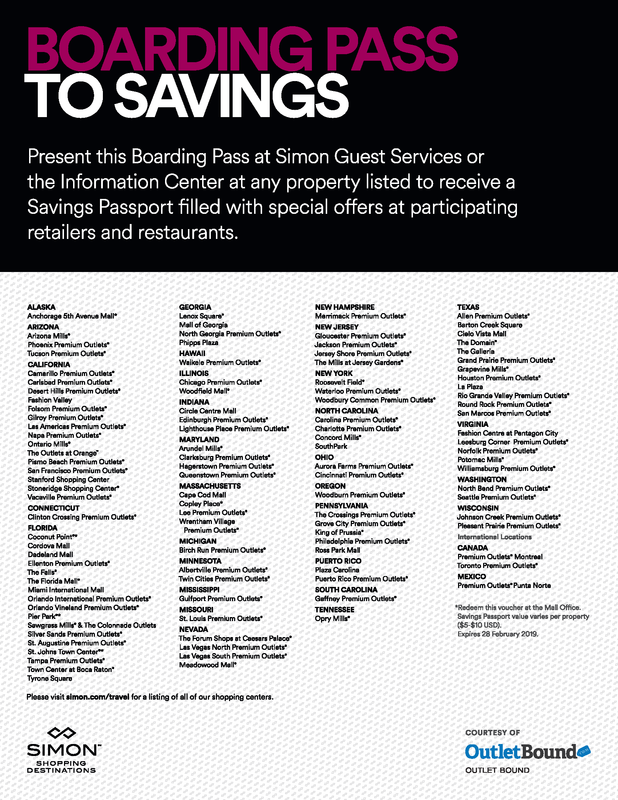 Get exclusive offers from outlet stores and retailers with the SIMON Savings Passport! Simply present a printed or digital version of this voucher to Customer Service when visiting the mall to receive you Savings Passport. * Stores and retailers can change frequently. For a complete, up-to-date list of stores and retailers, please visit this mall's official website before you visit.